It’s 1989. A red light blinks on your answer machine. You check your messages and you’re asked to go to a certain address to “help out” with various jobs. It’s time to suit up and the most important question is do you wear your dog mask or your chicken mask? 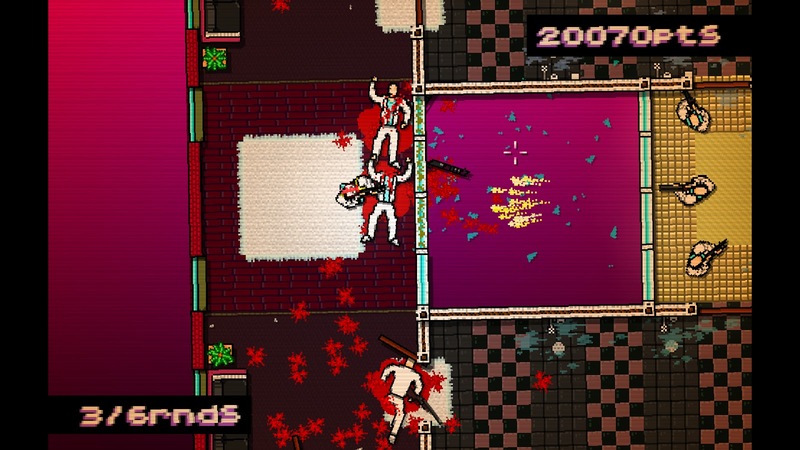 Hotline Miami is a truly bizarre game featuring some of the most violent content I’ve seen in a while. It’s a top-down shooter with pixelated neon graphics and incredible electronic music. The story is very confusing as you can’t figure out if the protagonist is on some sort of hallucination drugs or if he’s a sort of crazed hitman. Either way, to progress through this game, you’re going to need to stomach a lot of brutal killings. The game’s brutally tough. So tough that you’ll spend a good chunk of time replaying the same mission over and over. This is exactly how the 80's looked to most folks. Each mission starts the same way. You select from a variety of animal masks that are unlocked from beating missions, each giving you a special ability such as speed or faster attack. Then you try to murder everyone in the building you’re at. It’ll require some stealth of patience to get through some of these missions too. Going in with “spray and pray” is always an option but one bullet or knife chop to your body will leave you lying in a pile of that red stuff. A resource given to you is your ability to scope out rooms before entering them. Patrols walk around in rooms, waiting to paint the walls red with anyone that enters. A lot of times, this becomes tricky. If a guard sees you or hears you, they’re not afraid to charge in and investigate – with their guns and knifes. And you know the saying about bringing a knife to a gun fight? You’ll learn that sometimes blades are deadlier than guns. If you do want to Rambo your way through the game, there’s a variety of arsenal to choose from including shotguns, assault rifles, pistols, and sub-machine guns. The ammo is limited so you’ll spend a lot of time switching between guns. To aim, you just move your mouse toward the guy you don’t like anymore and fire. He’ll drop with one hit, just like you do. If you want to single out a target, you can toggle the character you want to single out with a click of a button. This is extremely helpful in fights with enemies carrying shotguns and their friends carrying bats or knives. The gore is excessive and will be very disturbing to some. For example, a good chunk of your stealth work will be you knocking people down via doors or your fists, then grabbing them to slam their head against the ground until their heads crack. It’s hyper violent in most all kills. Most rooms you leave will be completely red with chunks of body parts all over the place. If gore isn’t your thing, you’ll want to stay far away. It’s very entertaining and disturbing at the same time. There’s 19 missions that progressively become harder and harder naturally. Some of these missions will require you to fight bosses who take a tiny bit more of a beating and require you to move around a lot. You’ll die a lot but you shouldn’t feel frustrated with death. There’s no load time to jump back in the action and you learn patterns quickly this way. It’s essential the arcade stick shooter of Super Meat Boy. "We just cleaned this rug!" The controls will take a little while to get used to using a mouse and keyboard. Since the game now supports controller support, I’d recommend playing with a dual analog controller since it’s how these games are meant to be played.There’s 19 missions that progressively become harder and harder naturally. Some of these missions will require you to fight bosses who take a tiny bit more of a beating and require you to move around a lot. You’ll die a lot but you shouldn’t feel frustrated with death. There’s no load time to jump back in the action and you learn patterns quickly this way. It’s essential the arcade stick shooter of Super Meat Boy. 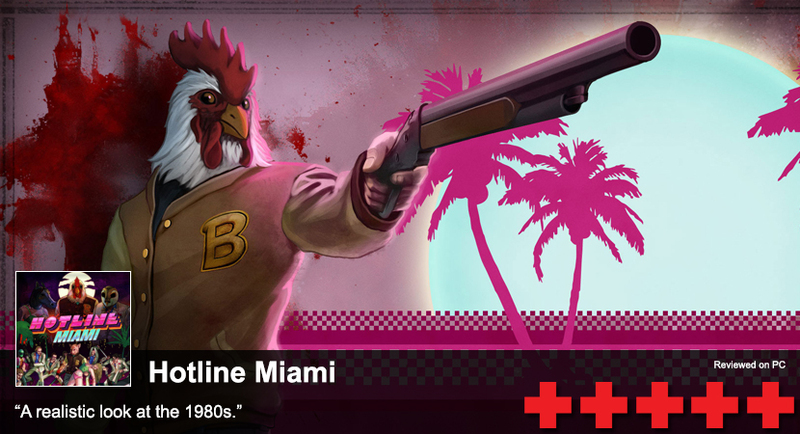 If you’re not a fan of playing games with the music on, Hotline Miami will change that. The music is electronic and cool. 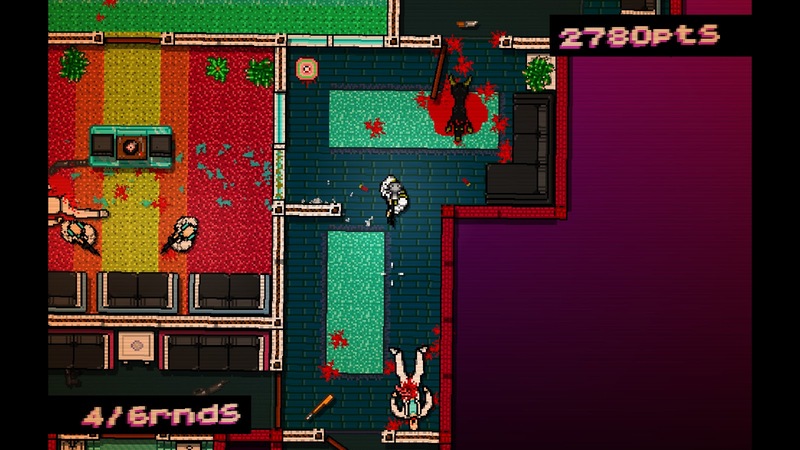 It fits well within this drug-crazed 80s game and pumps you up for the action. You know your in for a ride just by the menu’s slow acid jam it plays with neon themed text and black/hot pink color schemes. The whole game feels incredibly well put together and is why I consider a prime example of how to make a great indie game.